For an industry that measures time in generations, and works with centuries-old trees, the rapid warming of the planet makes for an uncertain future. Don Gale started sugaring as a boy, boiling sap outside on a cinderblock fire stand with old steel road signs for baffles. Later his parents would finish the process on the kitchen stove, cooking off so much steam that it parboiled the wallpaper from the walls. 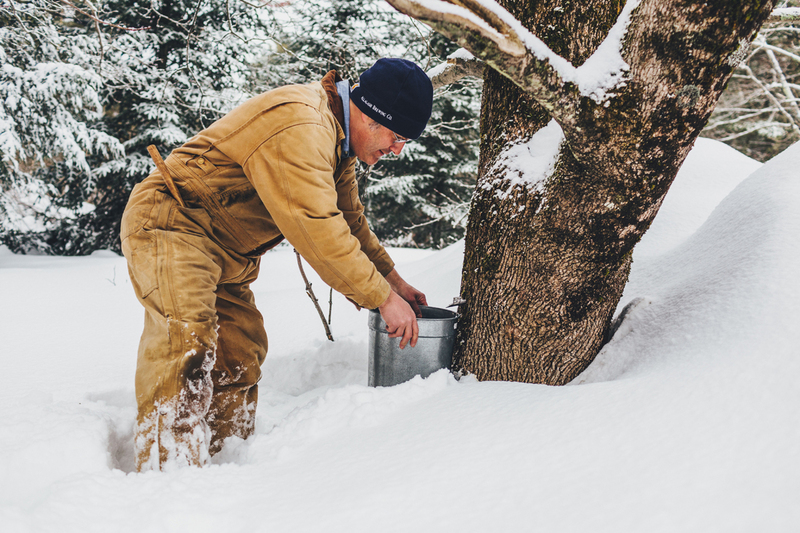 When Gale started his sugaring business in Vermont’s Green Mountains 20 years ago, he regularly worked in snow so deep that he could snowshoe back and forth between the bed of his pickup and roadside drifts. He misses that kind of late winter, when the night air was so cold and dry it caused a burning sensation in the nose, when the snow glowed ghostly blue in the moonlight and the days were all impossibly blue sky and brilliant white earth, bright even in the leafless deep woods. The sunlight was just warm enough to get the sap flowing in depth on depth of trees. “It used to be that when we were tapping, there was three or four feet of snow on the ground,” he said. “We just haven’t seen that recently. This year, we had a lot of rain and the snow was as slippery as the ice.” In place of snowshoes, this year Gale often wore ice cleats on his boots. Vermont’s maple sugaring season started early this year, with February temperatures hitting the 70s in some parts of the state and trees responding with a surge of sap. Temperatures plunged again later in the month, then rose, then dropped again. It’s a winter weather pattern that Vermont has seen repeated several times in recent years. The state is by far the nation’s biggest maple sugar producer, delivering more than 40 percent of the country’s total supply of maple syrup in each of the last three years. Many Vermont sugarmakers welcome the balmy weather, saying it will bring more sap. But such good fortune may be fleeting. Sugar maples evolved to release their sap when nights are cold and daytime temperatures rise above freezing. Once a string of days occurs without that nighttime freeze, sap stops flowing at the rates sugar makers require. Even if flows are sufficient to meet their needs, there’s also the risk of trees starting to bud. When that happens, sap quality degrades. Some studies point to long-term threats to the trees as well. In January, the journal Ecology published the results of research that found young maples will be vulnerable to hotter, drier temperatures causes by the changing climate. Exactly how quickly the change will occur is still up for debate. In February, the USDA Forest Service published an assessment of likely climate change impacts that predicts deteriorating conditions in the coming decades for iconic New England trees such as the paper birch, northern white cedar, and sugar maple. It projects shorter, milder winters, with less snow and more rain. The Vermont Climate Assessment project goes further. It cites research models predicting that by the end of the century, the northeastern forests could be dominated by oaks and hickories, with sugar maples and other trees being driven north to Maine. University of Massachusetts researcher Joshua Rapp points out that individual sugar maples can live for up to 400 years, and that means many mature trees can be expected to hang on even as their environment becomes increasingly inimical to young trees. Similarly, it can take a long time for successor species to move in and take over. Still, Rapp sees signs that the trees that are alive right now may also be responding to recent high temperatures. He’s noted a correlation in the last several years between hot Julys and comparatively low sugar content in maple sap the following sugaring season. Some technological advances may help sugarmakers weather such environmental change. 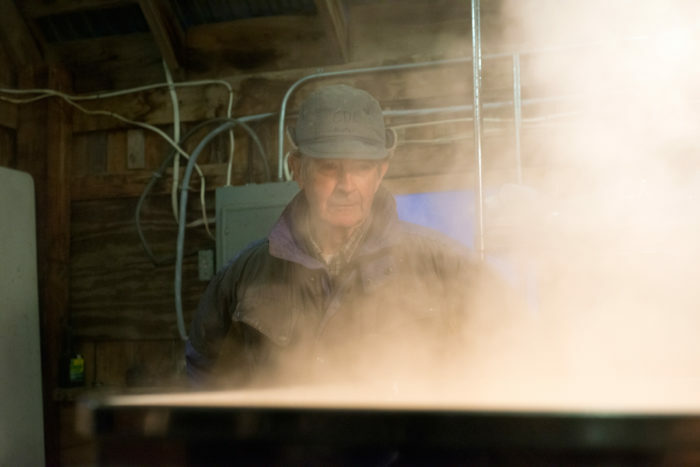 At the University of Vermont’s Proctor Maple Research Center, director Tim Perkins first noted more than a decade ago that climate change has shortened the sugaring season by about 10 percent. Nevertheless, syrup production has tripled in the last 15 years, thanks to improved use of vacuum tubing and more efficient taps drilled into the trees to draw out much more sap, Perkins said. The widespread use of reverse-osmosis machines also makes it much easier and faster to remove water and get to syrup, he said. Sugarmakers are investing heavily in such technology. Some still worry for the future of a craft that, for many, remains as much a family tradition as a business. Gale attributes Vermont’s new winter landscape to climate change. But Buster Grant, who at 80, remembers collecting sap in the iconic metal buckets instead of modern-day plastic tubing, is skeptical. He still enjoys hiking or skiing through the woods, listening to the winter birds, and stopping to look out over the snow-shrouded dairy farms around his stand of trees. This year, it was warm enough that Grant could have started drawing sap in January. He didn’t, he says, citing that old saw about how if a person doesn’t like Vermont weather, he should wait a minute and it will change. Sure enough, temperatures plunged for several weeks following the warm spell. Had he started early, when the weather turned he would have found his taps drying out. That’s just the business of sugaring, Grant says. Nearby sugarmaker Tim Bouvier isn’t sure what to blame, but he has certainly noticed strange changes, and not only in the trees. While hunting in February a year ago, he was bitten by a tick, an occurrence he would never have expected as a boy, Bouvier said. Government researchers throughout New England have tied milder winters to a surge in tick populations, prompting cautions about the increased risk of Lyme disease and reports of moose fatally weakened by the parasites in the dead of winter. Bouvier says the fear of Lyme disease won’t keep him from hunting, but he takes a lot more precautions against tick bites. Likewise, he’s looking into ways to take warmer winters into account at his 288-acre sugarbush—the term Vermonters use for a grove of producing sugar maples. Bouvier has offered a portion of his land for a University of Vermont study on substituting red maples, which are relatively heat-tolerant, for the traditional sugar maple. Champlain College anthropologist Michael Lange, author of Meanings of Maple: An Ethnography of Sugaring, points out that many Vermont sugarmakers are also dairy farmers, and all farmers give a lot of thought to the weather and to climate. In interviews for his book, climate change came up often, Lange said. Economics and business prospects played a big part in those conversations, Lange said, and so did people’s hopes of passing along the craft of sugaring. Some recalled columns of dates and sap production figures penciled on sugarhouse walls, from generation to generation. And the constancy of the trees in their family histories. “If you plant a maple tree, you’re hoping that maybe your kids will tap it someday, and if you tap a tree, it’s one that first germinated 40 years ago, at a minimum, or in some cases 100 years ago,” Lange said. It reminded the author of another project he’d worked on thousands of miles away, in a Moroccan village beside a lake that had been struck by a draught attributed to the changing climate. Lange remembered the loss on one man’s face when he told him he used to wake up to the singing of the frogs in the lake, and now he wakes up to silence. That might sound sentimental, but it’s not, Lange said. It’s an awareness of where things used to stand, how to apply that now, what the future might hold. Top photo CC-licensed by Allagash Brewing Co.
the rate of production of sugar is a point to be considered properly.